Syllabus of the Online Course (Subject): Ports of the Gabonese Republic (Port Gentil, Mayumba, and Libreville). Learning materials in or Ports du Gabon. Summaries in Portos do Gabão Puertos de Gabón. Description of the Online Course: Ports of Gabon. The largest ports of Gabon are Mayumba, Libreville, and Gentil (Gabon). OPRAG (Office des Ports et Rades du Gabon). 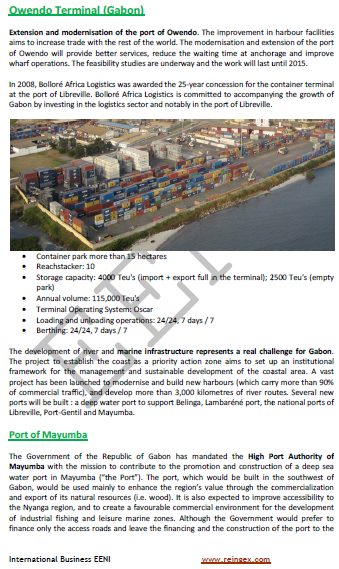 Case Study: intermodal port operations in Gabon. The Ports of Gabon belongs to the Central African Economic Area (African Civilisation).